Do you want to discover all the facets of your wine ? Whether it's a red wine, a white wine or a Crémant de Bourgogne, treat it to the right glass and it will express its full character. Wide or narrow, your glass will reveal its true color, its taste and its aromas. Crémant de Bourgogne wines should be tasted in glasses with even narrower bottoms than those used for white wines. Crémant de Bourgogne are sparkling wines. Once poured, the carbon dioxide which they contain turns into tiny bubbles which quickly carry the aromas to the top of the glass. To enjoy your Crémant de Bourgogne at its best, taste it in narrow glasses. For example, use a flute rather than a coupe. 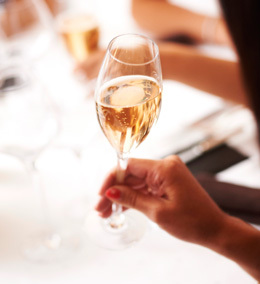 Your Crémant will be less exposed to air and will preserve its aromatic intensity longer, for your greater pleasure. To explore all the qualities of your wine, opt for an attractive glass that will please the senses. A well-adapted glass will reveal your wine’s most subtle aromas. The thinner and more crystalline your glass is, the more your eye will appreciate the color of your wine. 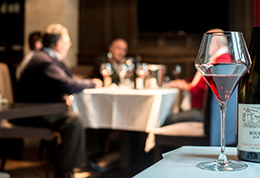 A fine glass also allows for agreeable sipping and helps you to fully enjoy your tasting. The choice of glass also has an influence on the aromatic expression of the wine, the key to rich olfactory sensations. Ensure it allows for a large surface in contact with air. This shape will contribute to liberating the wine’s aromas, especially if you swirl it gently around in the glass. This shape leads to a concentration of odor molecules at the top of the glass. Your nose can thereby better capture the aromas and identify them, for a genuine olfactory experience. … and awaken your senses. For a moment of intense pleasure, choose your glass according to the color of wine to be tasted. • Are you going to drink a red wine? Rich in odor elements, your wine will release its aromas more readily in a wide-bottomed glass, which allows greater aeration. • Are you going to drink a white wine? This type of wine offers more subtle aromas, which are better preserved in a smaller glass. Opt for a glass with a narrower bottom. Whether you are drinking a red wine or a white wine, you can also sample it from a tastevin. These small, shallow metal cups, which first appeared in the 18th century, typically have relief patterns and hollows. They allow one to admire the color and clarity of a wine before tasting. In Bourgogne, this traditional vessel has even given its name to a brotherhood, of which it is the symbol. When you pour your wine, only fill the glasses up to one-third of their height. This leaves room for the aromatic elements to circulate well in the bowl of the glass. As such, you can fully capture the aromas released. Your tasting will be greatly enhanced. When you are tasting, hold the glass by its foot so that the wine does not warm up too much.